The city on the River Pegnitz is the 2nd largest in Bavaria and the cultural center of northern Bavaria. The settlement developed around the castle, which played a major role in the administration of the Holy Roman Empire: The Imperial Diets were held there every year, the assembly that governed the empire. By the 14th century Nuremberg had become one of the most important cities in Europe alongside Cologne and Prague. The city also owed its prosperity to its location at the crossroads of major trading routes in central Europe and to the fame of its craftsmen. The artist Albrecht Dürer spent the last 20 years of his life in Nuremberg and his 15th century home has been rebuilt. Because of its key role in Germany’s history, the Nazis chose the city as the site of huge propaganda events during the Third Reich called the Nuremberg Rallies. The Allies held the Nuremberg Trials there after the war for the same reason. The main sites are the castle and the Frauenkirche (Our Lady's Church). The church is best visited around noon, when the figures of the 500-year-old clock re-enact a scene involving Emperor Karl IV being surrounded by seven electors. 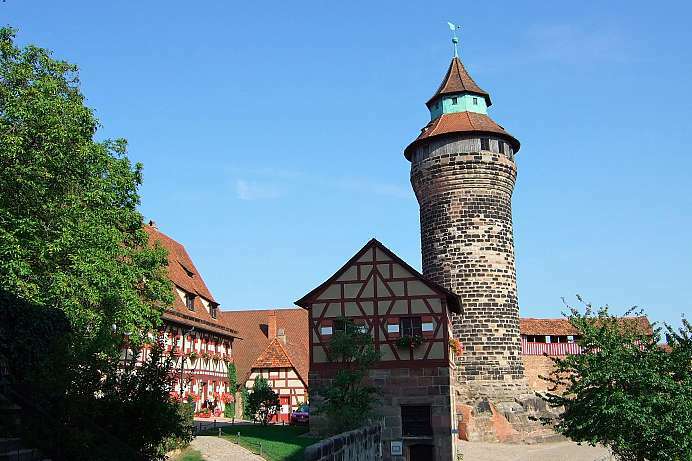 The castle is the landmark of Nuremberg. It consists of the Imperial Castle and the Viscount Castle and is amongst the most important fortresses in Europe. Between 1100 and 1571 all German emperors resided at least temporarily in the double castle. During the National Socialism the castle was fundamentally altered. During the Nuremberg Rallies, held annually in Nuremberg, high guests of state were to be accommodated in the castle. In 1944 the complex was bombed and subsequently re-established in its historical form after the war. Tours are held daily between 10.30 and 15.30 half-hourly.